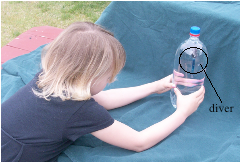 An example of a science-rich activity that helps kids develop intuitions about sinking and floating, it would be hard to find a better one than the Cartesian Diver. • Cut off any label and clean the bottle with warm water and soap. • Use a goo-remover or citrus juice to clean away the glue residue. 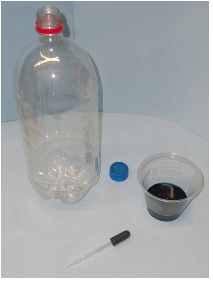 • Fill the bottle to the brim with cold tap water.• Put four or five drops of food coloring (no yellow) in a quarter-cup of water. • Screw the top on tight. • Squeeze the side of the bottle to make the eyedropper dive, release the pressure to allow the diver to rise. 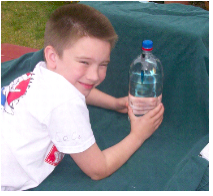 Joshua demonstrates the action of the Cartesian Diver in this picture and the folllowing short video. He is proud of his ability to apply just the right amount of pressure to keep the diver at a constant level. The purpose of the food coloring in the barrel of the eyedropper is help the kids focus on observing the rise and fall of the water level in the barrel as the bottle is squeezed and released. Let the experience speak for itself but if you would like a list of the science concepts demonstrated by a Cartesian Diver, email your request to www.grandadscience@gmail.com and I will respond immediately. 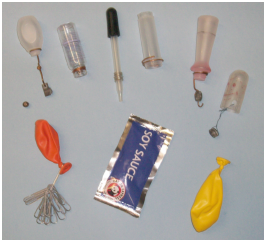 To illustrate that a Cartesian Diver can be made from almost anything, here’s a shot of my Cartesian Diver collection. The yellow balloon has a lead fishing weight inside. In my next hands-on activity post I will share a simple method for observing how to lift a dime with only the heat of a hand. how do u stear it? Like make it go side 2 side?